Here are some (hopefully!) simple istructions for accessing and using our chat room. We have a weekly chat on Tuesday evenings, from 9-10 P.M. Eastern time. This is also where we hold our on-line classes. Here is the Login screen for the chat. Type your name or a nickname in the box. This will be your screen name for this chat session. We don't use passwords on this site, so you don't need to enter one. 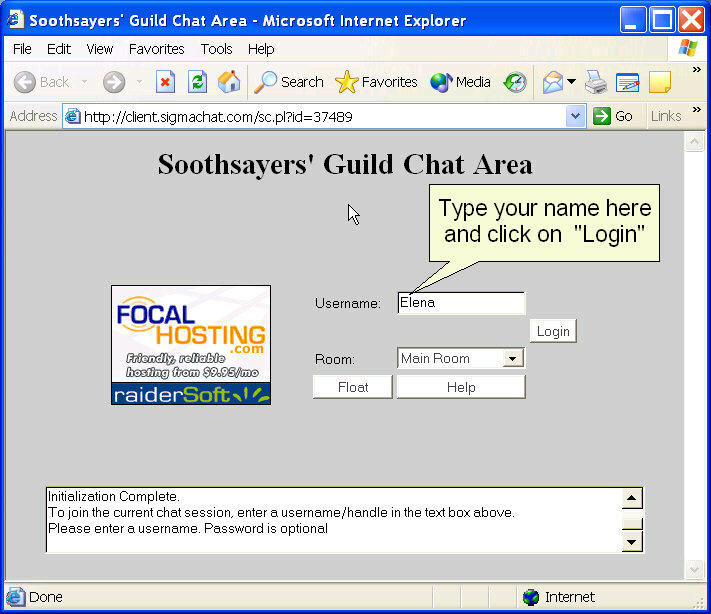 This is the Chat Room itself. On the right you will see a list of who else is in the room. Type what you want to say in the message box and press the Enter key on your keyboard, or click the Send button on the screen. What you typed will appear in the text area in the center of the screen and everyone in the room with you can see what you typed. That's all there is to it! Sometimes it may take a minute for people to answer you. Don't worry - you're not being ignored! And it doesn't matter if you're not the world's fastest (or most accurate!) typist. People in chat rooms usually understand and ignore most "typos".